Home » Emotions » For What Are We Remembered? What gets passed on are our “qualities of being.” When I reflect on my parents, my sister, and others in my life, this is what I remember; for example, my mother was loving, caring, giving, and always present. But, she was also a bit over-controlling and dominating. She was a type 2, the Giver/Helper, with a connection line to Type 8, the Protector/Challenger. She also had some awareness, response flexibility, and joy. Yet, I don’t remember much about the content of her life, e.g., how she met my father, her church activities, her friendships, or too much about her personal desires. In the case of my youngest son, who passed away at age 25, I remember his exuberant, nurturing and endlessly hopeful, caring qualities. So what are the higher qualities (Holy Ideas) of being for each of the nine Ennegram types? And, how do they manifest in each of us, according to our type structure? 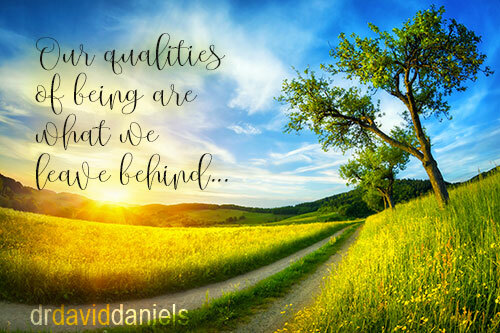 It’s these qualities that we need to experience and then learn to integrate into our lives. Type 1 – the Perfectionist/Reformer – Perfection is the original, undivided state of being. Perfection that can be found in all things, in each moment, and the associated virtue of serenity which is the felt experience of perfection with an appreciation of differences It includes an appreciation and acceptance of all that there is, just as it is. Type 2 – the Giver/Helper – Freedom, as in my freewill, is the original state of being. The freedom to meet another’s needs, or not, and that decision is based on universal free will. The associated virtue, that evolves from the free flow of giving and receiving of life energy is called humility, where any given individual is not better than another, hasn’t done more for another, and is imbued with grace. For Type 3 – the Performer/Achiever – Hope is the original state of being, in which things get accomplished and carried forth, according to universal laws and hence are not dependent on anyone’s particular, singular effort. The associated virtue of veracity accompanies this which allows for expression of one’s own true feelings and display of an authenticated self. Type 4 – the Romantic/Individualist – Connection to our universal origin is the original, ideal state of being in which nothing of substance is missing. The virtue of equanimity, mental calmness and composure, is aplomb and is in connection to all things. It embodies the state of significance and wholeness. Type 5 – the Observer/Investigator – Omniscience is an all-knowing state of being, the state of directly experienced consciousness. The associated virtue of non-attachment means that the flow of universal energy meets our needs, without a fear of draining us, overwhelming us, or requiring something of us beyond our state of being. Type 6 – the Loyal Skeptic/Loyalist – Faith is the original state being. This is a faith in the self, others, and in the universe. Imbued in faith is the virtue of courage, allowing us to move forward in life, despite the presence of fear. Type 7 – the Epicure/Enthusiast – Holy Work is the original state of being. A state of focused concentration in the present moment; it is constancy combined with the ability to be grounded and present. The virtue of sobriety allows us to traverse the spectrum of life, including the many feelings that drive us, scare us, excite us, sadden us — fully and freely. Type 8 – the Protector/Challenger – Truth is the original state of being. Sensing the essential truth in everything and everyone is not just about me, but it’s the recognition of the truth that is embodied and expressed in others. The virtue of innocence brings forth an unbiased freshness and a simplicity that allows us to come with a beginner’s mind to every situation. Type 9 – the Mediator/Peacemaker – Love is the original, blissful state of being. An unconditional love, and a union with others and the world, is to what everyone belongs. The virtue of right action means the capacity to engage, to take action, and in such a way that it includes the self and others equally. For me, taking responsibility for and hence owning what we are remembered for is key to the legacy of our lives and to the future. We are remembered, but not as much for what we accomplish in the material world, despite that being what drives so many of us. We are in fact remembered for our qualities of being. This makes working with the Universal Growth Process (UGP), the “5As” — Awareness, Acceptance, Appreciation, Action, and Adherence — even more fundamental, yet, we need to know what each of these qualities actually means. Working with the “5As” makes our personal development work something we gift our children’s growth and development. Doing this work helps us access times where we were at our best, and those times are evident. And, it’s those times that eventually become our legacy. Go back to one of those times in your own life, especially the somatic component, the felt-sense experience, as well as return to the feelings and thoughts you had when at your best. This provides us access our higher qualities. We can also practice coming back to these remembered experiences at times of upset and reactivity. This provides us with a way to reconnect with ourselves consciously and thoughtfully, keeping us closer to our higher qualities of being, to how we’d surely like to be remembered. Take some time to reflect on how we are remembered, and how much what we are remembered for, actually really matters. Then, feel free to share, what are your thoughts and feelings? Have you ever really reflected upon this? What do you experience when you think about how you will be remembered? I welcome the conversation. Add to this blog. I so appreciate your responses. Thanks again David – I have shared this with friends, who have responded positively. Thank you for this lovely blog. I appreciate you immensely and all you’ve brought to the world and especially the Narrative community. As I have said many times, you have touched so many with the qualities you speak of. I am a grateful recipient of them and hold you in my heart during this holiday season. Wishing you and your family much love.